As moms, we spend so much time and energy taking care of others, that sometimes, we neglect to take care of ourselves. It may sound cliche, but you can’t pour from an empty cup. You’ve got to spend some time taking care of yourself to better take care of others. You’d be surprised by how much some holistic self-care can improve your mood and well-being. I have teamed up with the folks at Brentwood Home for this awesome giveaway, featuring some holistic wellness items for your home ($139.00 value). 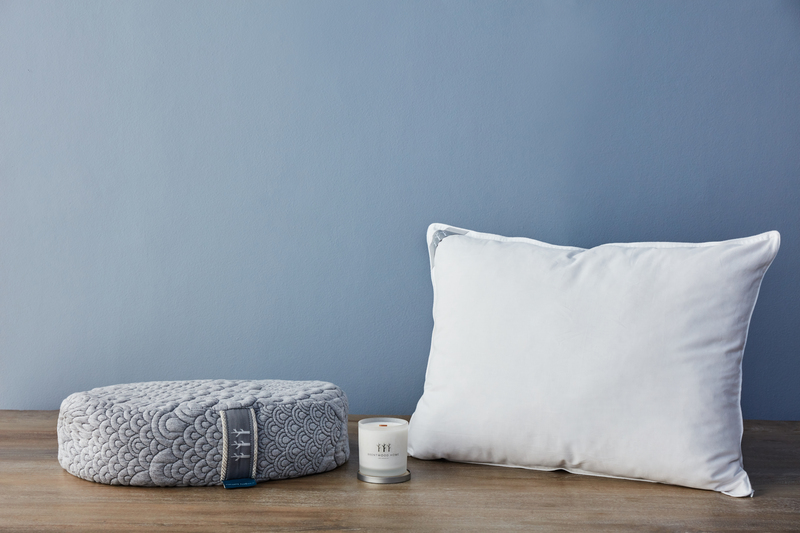 These bedroom staples will help you calm your senses before you get to sleep, plus they’re all made with healthy, natural materials that are safe for you and your home. Designed with guidance from one of LA’s top yoga instructors, Angela Kukhahn, this pillow will bring just enough height and support to your meditation practice, allowing the delicate curves of your spine to fall into place for extended periods of sitting. Best of all, it’s made with natural materials, including a fill of buckwheat hulls and an inner-liner made of all natural cotton. This pillow is great for meditators and yogis of all skill levels and styles, or simply sitting and relaxing. This Brentwood Home pillow combines the smoothness of silk with the fluffiness of cotton. It’s filled with silky-smooth kapok and all-natural latex ribbons that have a responsive feel. The cover is made of organic cotton, grown without toxic pesticides or fertilizers, so you can sleep safe and sound. This pillow will be the perfect fit for people who switch between multiple sleeping positions, because it molds to your neck and head no matter how you move. Aromatherapeutic scents soothe the mind and body, putting you in the perfect state of mind for a great night’s sleep. Brentwood Home’s candles are made using healthy materials like all natural soy wax and essential oils, and they smell delicious! Please enter through the Rafflecopter below. It may take 30 seconds or more to load. Thanks for the chance to win! I would love this prize! I love them all but my favorie is the pillow. I sleep in more than one position so this is perfect for me. My favorite item is the candle. I like the latex/ kapok pillow. The Meditation Pillow would be great! It would something I would definitely use. I like the candle in this group. My favorite item is the pillow. I love the Crystal Cove Meditation Pillow. It looks comfy! My favorite out of the bundle is the Latex/Kapok Pillow. What a great bundle of prizes. Sorry. My service provider for the emails was having trouble yesterday. It’s working today. Please try again. My favorite is the Crystal Cove Meditation Pillow. Thanks. I’m a really picky pillow person, I have bad neck problems. This Latex/Kapok Pillow sounds really good! The aromatherapy candle sounds great. I would love anything to help me sleep better!